Happy weekend and I hope this week has been quite productive for you. I’ve been wanting to do a review of these Soap & Glory products since they came in but I decided to try it out for a few months you know, in order to be able to write something worth the review. Before i received them, I had just seen a review of a Soap & Glory product on one of the blogs I follow and my first thoughts were, ‘Oh nice packaging. Lol. I have a thing for pink though. It’s super creamy and smoothing. It lathers moderately, cleans well and leaves your body smelling all nice. It’s that kind of wash that moisturizes while cleansing and it seems to me it also has anti-inflammatory properties. I used it a few times on my face and each time I did, It actually soothed my face – you know that feeling of relief your skin gets from using harsh chemicals? A con for me is that it’s not a wash you can use on your face consistently if you are acne prone. Because of all the oils in it, it can leave you face with some heavy pimples so I stay away from using it except of course I feel my face is inflamed. Some of its popular ingredients are water, Rapeseed Oil, Citric acid, Grapeseed oil, Oat, parfum (fragrance), lactic acid, sweet almond oil, caramel and Honey. Lest I forget, it also tastes sweet so you might wanna keep away from little children. 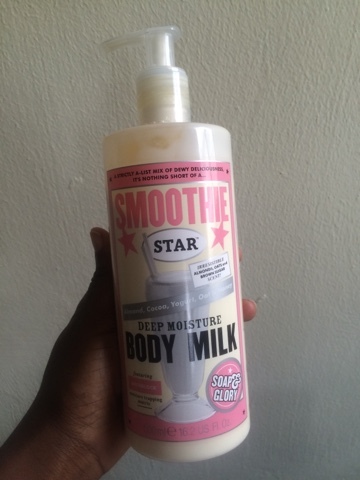 The use along Soap & Glory Smoothie Star deep moisture body milk looks just like the wash. You can immediately tell they are siblings. It’s also quite creamy and very moisturizing. It’s smooth as you work it into your skin and quite shiny. 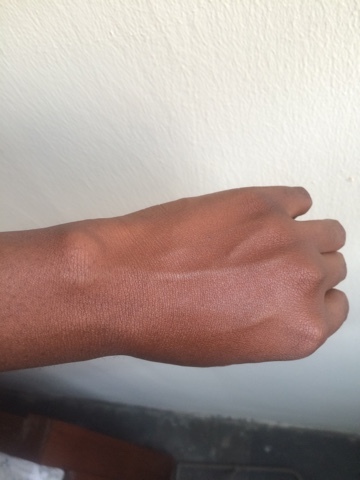 If you have dry skin, this product should be good for you. Some of its popular ingredients are Water, Mineral Oil, Glycerin, Sweet Almond Oil, Shea Butter, Cocoa Seed Butter, Oat, Parfum (fragrance), Yogurt powder, Coconut Oil, Sweet Almond Seed Extract, Cocoa Extract and Honey Extract. The first thing that stole my heart about the product is the packaging. It’s really lovely and has an attractive fragrance. They are products you would use and immediately fall in love with it because of the way they smell. It is said to have the irresistible almond, oats and brown sugar scent. Using both products actually tone your skin over time as it appears fresher and shinier. They both come in 500ml bottles and retails for about £35 on Amazon which is about 10,000 plus each. For body cream and soap, I think it’s quite pricey but pricey I know is subjective. I will give both products 4 / 5. 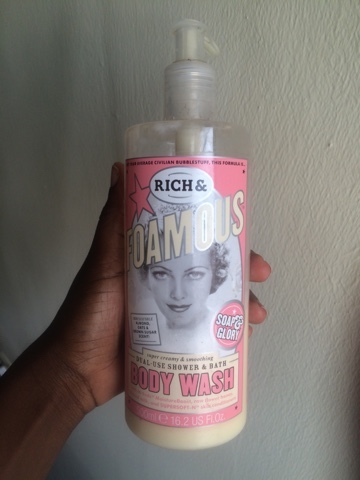 Have you tried any Soap & Glory Product? How was it? Hi. Yes it does. You can shoot me a mail at herdarkskinglows@gmail.com Looking forward to hearing from you.